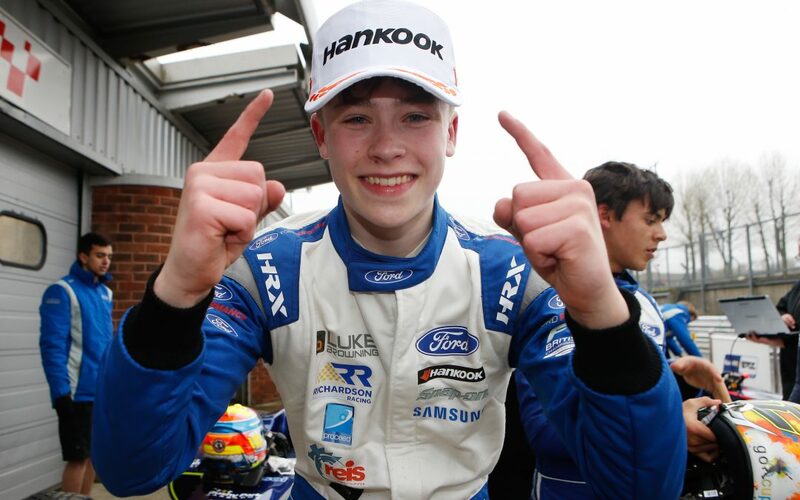 Rising star Luke Browning was able to celebrate a breakthrough victory in the F4 British Championship certified by FIA, powered by Ford EcoBoost after an impressive opening weekend of the season at Brands Hatch. Making his debut in the single-seater series, Luke showed strong pace on track throughout the weekend and was rewarded with two podium finishes from the first three races of the campaign. Having lost track time during Friday testing after his Richardson Racing team discovered an issue that required an engine change, Luke went straight into qualifying on Saturday morning on the back foot. Despite being limited to half the laps of his rivals, the Cheshire racer secured tenth place on the grid with a best lap less than four tenths of a second away from pole – but with the promise of much more to come in the opening race of the weekend on Saturday afternoon. The arrival of rain prior to the start added a further challenge for Luke in his maiden single-seater race, but an astonishing start saw him rocket up the field into fourth by the end of the opening lap. Quickly getting ahead of former Ginetta rivals Louis Foster into third on lap two, Luke then battled his way past Zane Maloney into second before chasing down the early leader Joe Turney. Having closed on the Carlin man with a series of quick laps, Luke wasted little time in making his move for the lead and having taken the lead before the half way stage, pulled away from the pack behind to secure a stunning debut victory. Sixth on the grid for the second race of the weekend thanks to a reverse grid switch, Luke dropped back to tenth after a slow start but soon set about fighting his way back through the field once again. Picking off the drivers ahead in tricky and damp conditions, Luke found himself once again in the podium places by the half-way stage of the race and then moved into second shortly after a brief mid-race Safety Car period. Lapping quicker than anyone else on track, Luke chased down the leader Zane Maloney and when he left the door open at the final corner, Luke saw his chance to go down the inside and made a move stick to secure the win on the road. An unfortunate penalty post-race demoted Luke back to third place before he ended the weekend with seventh in race three having again started tenth as a result of the grid being determined by drivers second best times in qualifying. At the end of his first weekend in single-seater competition, Luke sits an impressive second in the championship standings. “It’s been an awesome weekend all round for the team,” he said. “Qualifying was difficult but the first race was brilliant and to come through and win from tenth on the grid was unbelievable. It was all down to the hard work we have put in in pre-season testing and it really paid off. UNBELIEVABLE start to the season young man..
Ian Giles on COMPETITION TIME!!! Marion Hill on COMPETITION TIME!!! Tony Tomkinson on COMPETITION TIME!!! Jack Mayor on COMPETITION TIME!!! Josh Downard on COMPETITION TIME!! !